Our Beatriz Ball WESTERN Antler large decorative metal bowl celebrates the West in its lively presentation of your favorite foods. 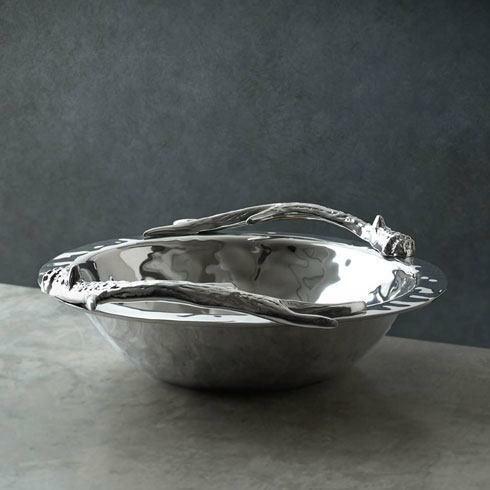 A round metal bowl with sculptural antler handles that is great for salads, but equally suited to serving your favorite chips, veggies, and sides in exuberant Western style. Makes an awesome centerpiece, too! Made of decorative silver looking polished metal that is tarnish free, and perfect for the Great Outdoors. Made of a top quality, FDA safe, easy-care, oven and freezer friendly aluminum alloy.